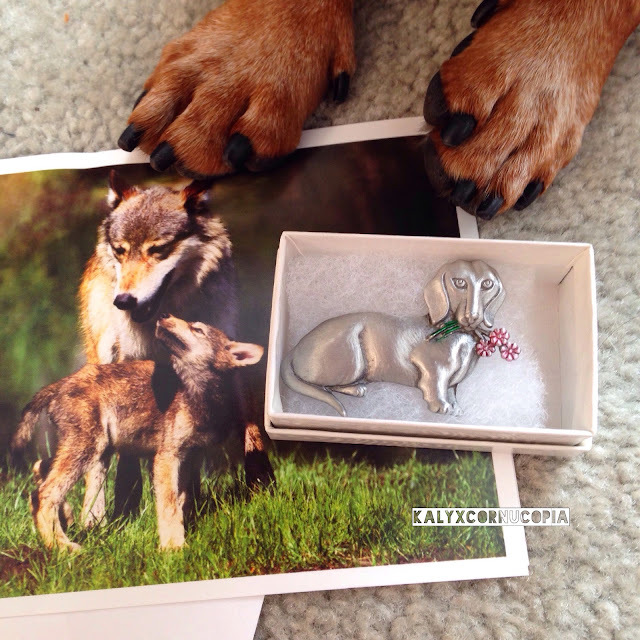 yesterday a special package came in the mail from my friend miss debbi and words cannot even express mom and dad's glee at what was inside, or mine either because looky - she sent us a lovely doxie pin, and a card that was addressed to mom and dad but had a super secret howdy message on the outside that I know was just for me. u know, from one wolf to another. one lucky wolf to another, I should say. especially since that pin she gave us? he is totally holding purpley pink flowers which everybuddy knows is the universal secret stand over there or suffer the stink of purple flowers sign. so when mom wears it and I am by her side, no worries on walkies! well diary, I have to go so I can ask dad if he can help me write a proper thank u note to miss debbi and then I am going to ask duk duk if he wants to pedal with me 2 the store so we get the gummy worms he owes me back and a frame for our Wolf card so we can hang it in our heat cave.